One of many places on the planet that travellers want to visit is a small but amazingly beautiful country, comfortably located in Central America, washed by the soft waves of the Pacific Ocean from the west, and the "pirate" waters of the Caribbean Sea from the east - Costa Rica . It is worth mentioning that Costa Rica is the second state among the countries of this region in terms of living standards succeeded only by the neighboring Republic of Panama. In 2008 and 2012 it was recognized as the happiest country in the world. Mostly the "white" population lives here. Aborigines - Huetar – have been eliminated or moved to another territory. However there are no traces of them found in any of neighboring countries. The reason is well known - the conquest. The Huetar have remained in the history of mankind as creators of unique giant stone balls, scientists have been unsuccessfully trying to solve the mystery of their construction for decades. Costa Rica is the only neutral country on the American continent. In 1948, it refused to use the army. It is also one of the safest countries in the world. This miniature state can boast not only stable development, prosperity and the title of "one of the best resorts in the world", but also the uniqueness and great variety of nature. Fantastic little animals, bright birds and nimble fish, who found their Eden here, sometimes represent the only remaining population on our planet. 550 km from the coast of Costa Rica leis the uninhabited island of Cocos . The famous writer R. Stevenson settled the hero of one of his novels - the one-eyed captain Flint, and the famous explorer of the sea depths Jacques-Yves-Cousteau called the island "the most beautiful". This place has not been affected by modern civilization. It is covered with a whole array of forest jungles. The Republic also owns a few small uninhabited islands. The amazing and stunning National Park of Monteverde - can rightfully be called the peak of the authentic beauty of the tropics: the humid thicket hides on its expanses rare representatives of the fauna. "Paradise" bird Quetzal, which lives here, is listed in the Red Book and is found only in the local forests of Costa Rica. In ancient times this bird was considered sacred. 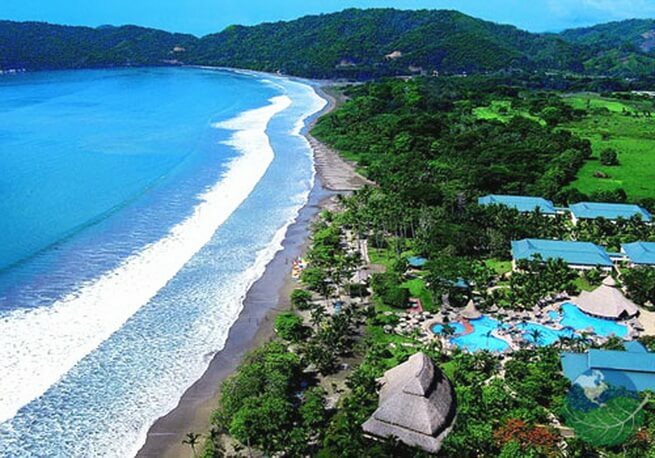 On the coast there is a park named after the famous Paraguayan politician Manuel Antonio. The park is one of the most famous holiday destinations for wealthy people. The diversity of vegetation, animals and birds made this corner of Costa Rica truly attractive for tourists. The virgin forests of the park, surrounded by the picturesque shore of the ocean, do not allow modern urban sounds to disturb outdoor recreation. Silence, tranquility and a wonderful atmosphere make it possible not only to lie on a sandy beach at the water's surface of the ocean, substituting the body for the tender rays of the sun, but also to fish, dive and surf. The city of the same name is located nearby - a popular holiday destination, familiar to many by its snow-white beaches, surrounded by numerous bars, restaurants, clubs and discos. Another popular symbol of Costa Rica is the Arenal volcano. The territory adjacent to the volcano is occupied by hotels, hotels and restaurants, the owners of which every year shudder from a loud growl, heard from the depths of an active volcano. Now the volcano is part of the Arenal Park, which also includes 16 reserves and 8 protected areas. On the territory of the park there is an artificial lake Arenal, located at an altitude of more than 1.5 km above sea level. There are always many fans of windsurfing. On the territory of the country, according to scientists, there is the only tropical forest in Latin America, which is preserved and growing in natural conditions. This is the Corcovada Park, which provides a reliable shelter for many endangered species of fauna, such as Tapir Baird, a giant anteater and harpy. It is located on the Osa peninsula. The park is a great place to relax in close proximity to the untouched nature. The Tortuguero River basin hides a national park with the same name. Here is the place of nesting of some species of sea turtles listed in the Red Book. The park gives shelter to the white-capped Capuchins and broad-shouldered howlers. Fans of flora and fauna will be surprised by a great variety of animals, birds and water creatures. Walking through the park you can hear a slight crackle of twigs under the soft paws of ocelots; see a curious, turned to the tourist, the look of three-fingered sloths. The purity of the water is confirmed by the caimans living here, living only in crystal clear water. Nearby, lazily heating their backs crocodiles and American manatees can be found. Only for such unique parks and fantastic rainforests, it is worth visiting Costa Rica. The presence of entertainment, restaurants and bars will only complement those magical conditions that have already been created by the local Costa Rican nature. It remains to add that in the famous work of M. Crichton "Jurassic Park" the action takes place exactly in this place. Filming of this novel took place on the island of Cocos.